I have much news to share, and it's been quite an adventure already. We left on Monday morning, bright and early. Saw two moose on the Palmer Hayflats. YAY for wildlife! Our most exciting wildlife sighting (outside Tok) was a moose in the middle of a pond with her head down eating plants and her baby off to the side watching. Video to follow once we upload it. Saw 15 total swans throughout the drive. 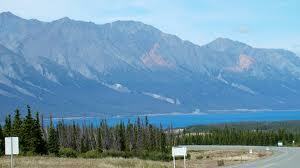 We spent the night at Talbot Arms Motel overlooking the gorgeous Kluane Lake. Just as beautiful as the picture. Full of fish, I hear. The motel was classic 60's. Bright orange counters, no phone, no shampoo or conditioner, and seven channels on the TV. Today, we drove through gorgeous weather and scenery. Stopped for lunch in Whitehorse at Tim Horton's. I love that place... everything you order comes with a doughnut. Awesome. We walked around downtown and saw the S.S. Klondike. I could definitely live in Whitehorse. Beautiful trail along the Yukon River with folks strolling along enjoying the sunny weather. Stopped in the cutest cafe named Baked. After we drove up the highway above Whitehorse, we saw two coyotes right next to the road, waiting to cross. Now, we are in Watson Lake, and hotel rooms are scarce. The first hotel had one room left with a kitchenette and jacuzzi for $154. The second hotel's lobby reeked with smoke, and it was a little scary. With one hotel left as our savior, we just took it, and it's full of character. Boy, oh boy. 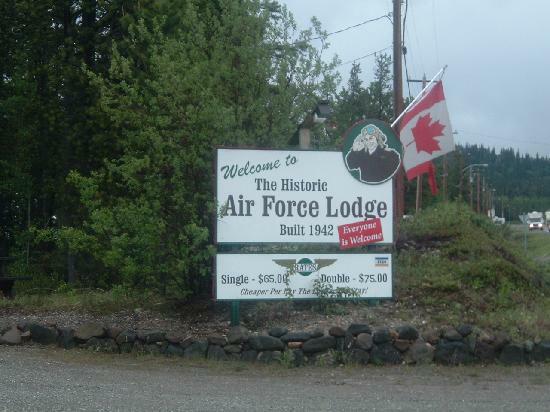 The Air Force Lodge is restored pilot's quarters from 1942. Separate bathrooms down the hall from the rooms. I don't mind that too much since they are super clean. The room is 12 x 12 with two extra long twin beds pushed together. Since it's hard to find a comforter to fit such an unusual bed, they have two comforters on it, overlapping. I love it! No restaurants are open now, so we are eating turkey sandwiches on the bed. Yes indeed, adventure is worthwhile. Hope everyone is doing well and had a nice Labor Day Weekend. Please keep in touch!